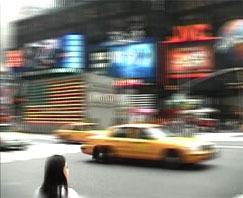 The video material was shot mainly in two locations in New York, around Times Square, and in Chelsea, in 2004. The digital treatment of the images is echoed and paraphrased by the sound which processes recordings in a multi-layered composition. The sound is not designed to 'accompany' the visual material like music accompanies film in conventional cinema. Rather, the energy and flow of the images suggests some kind of equivalence in sound; density, pace, foreground, background, solo and ensemble all contribute to the overall results. Jeremy Welsh and I search for a shared vocabulary to describe the process through which we go to make our work but we know that although we share the same words they don't have the same meaning for each of us. Nonetheless the words are often useful. Robert Worby is a composer and sound artist based in London. His work is rooted in a fascination with sound itself - its characteristics, its textures, shapes and patterns - and the idea that, when sounds are combined, meaning becomes multi-faceted, slippery and difficult to pin down. He has been working with the video artist Jeremy Welsh for many, many years. Jeremy Welsh is Professor of Fine Art, Bergen National Academy of the Arts and MA course leader since 2004. He was previously Professor of Intermedia at Trondheim Academy of Art 1990-2001. He studied Fine Art at Nottingham Trent Polytechnic and Goldsmiths College, London. During the 1980s he worked with artist media centre London Video Arts and then co-founded The Film & Video Umbrella, a production agency for artists’ film & video. Welsh has exhibited and published internationally since the early eighties.